Added new Beastiary commands for adding creatures to the Beastiary. (/lm beastairy add creaturename -or- /lm beastiary complete). Fixed a bug where flying mounts would ignore player mvoement and fly where they want. Fixed a major pathing issue causing large water mobs to not move at all unless they were near fully submerged. Fixed a bug where pet/mount/familiar inventories weren't be loaded causing the loss of their items. The new Sutiramu have joined the Arachnophobia event. The new Triffids have joined the Root Riot event! The new Aglebemu have joined the Bamstorm event! The new Quillbeasts have joined the Blade Flurry event! The new Gorgers have replaced Salamander in the Eruption event! Updated some of the Russian language entries for the demon mobs content. Picked up or feared entities including the player are now immune to suffocation damage. Large mobs such as Arisaurs, Striders, Threshers, etc are no longer affected by whirlpools and can no longer be picked up. Roa/Thresher whirlpools will no longer affect allied creatures such as their owner and owner's pets. Disabled Hit Areas for performance as they are no longer required. Fixed a bug with the new model system causing the Roa and Thresher to render the saddle/armor textures on their whirlpool effect mesh constantly. Suppressed a crash caused by setting a certain key for Minion Selection. 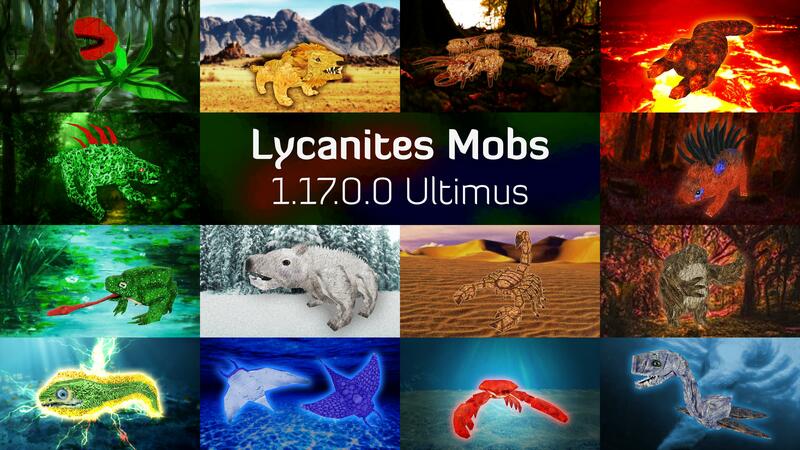 ============================================================ Lycanites Mobs Update: Ultimus - Version 1.17.0.0 for Minecraft 1.11.2 Configs older than 1.14.2.2 will be reset. ============================================================ -------------------- New Features: -------------------- New Arctic Mob Added: Maug New Desert Mob Added: Sutiramu New Forest Mob Added: Calpod New Freshwater Mob Added: Thresher New Freshwater Mob Added: Ioray New Freshwater Mob Added: Abaia New Inferno Mob Added: Gorger New Jungle Mob Added: Dawon New Mountain Mob Added: Wildkin New Plains Mob Added: Feradon New Plains Mob Added: Quillbeast New Saltwater Mob Added: Herma New Swamp Mob Added: Aglebemu New Swamp Mob Added: Triffid Added new Beastiary commands for adding creatures to the Beastiary. (/lm beastairy add creaturename -or- /lm beastiary complete). -------------------- Major Fixes: -------------------- Fixed a bug where flying mounts would ignore player mvoement and fly where they want. Fixed a major pathing issue causing large water mobs to not move at all unless they were near fully submerged. Fixed a bug where pet/mount/familiar inventories weren't be loaded causing the loss of their items. -------------------- Changes: -------------------- The new Sutiramu have joined the Arachnophobia event. The new Triffids have joined the Root Riot event! The new Aglebemu have joined the Bamstorm event! The new Quillbeasts have joined the Blade Flurry event! The new Gorgers have replaced Salamander in the Eruption event! Updated some of the Russian language entries for the demon mobs content. -------------------- Balancing: -------------------- Picked up or feared entities including the player are now immune to suffocation damage. Large mobs such as Arisaurs, Striders, Threshers, etc are no longer affected by whirlpools and can no longer be picked up. Roa/Thresher whirlpools will no longer affect allied creatures such as their owner and owner's pets. -------------------- Minor Fixes: -------------------- Disabled Hit Areas for performance as they are no longer required. Fixed a bug with the new model system causing the Roa and Thresher to render the saddle/armor textures on their whirlpool effect mesh constantly. Suppressed a crash caused by setting a certain key for Minion Selection.